I think we can all agree, this palette has caused a buzz in the beauty community. Not necessarily for all the right reasons but a buzz none the less. Now, I ordered this palette as soon as it went live on the website therefore before the tonnes of reviews that then flooded my social media. I did a full first impressions video over on my YouTube channel which you can check out by clicking on this link. However, I still wanted to do a full review on my blog as a first impression is just that, a first impression, which can change the more you use a product. The palette will set you back £41 for 14 shades and is the sister palette to the Modern Renaissance palette (again, I have reviewed this one in full so go and have a look if you fancy). The packaging is very similar to the Modern Renaissance palette, its in the same felt-feel case and the eyeshadows are set out in the same way. The casing of this one is a beautiful green shade with yellow writing, personally I really like this colour combo but unfortunately the material does get dirty quite easily. The best way I can think to describe the shade range is 'out there', there are teals, purples, oranges and yellows amongst others. 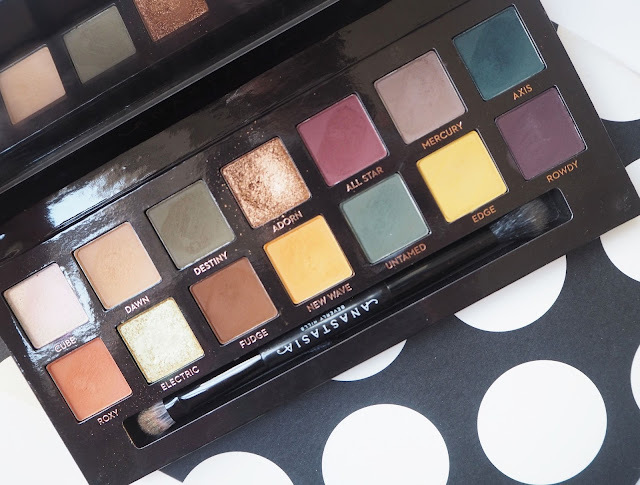 Prodominantly the palette is made up of matte shades, 11 of them, with 2 shimmers that are very close to being foils and one duo chrome shade too. Initially when I saw the colour range in here I actually really liked it, its not the norm I would go for but because the formula of the Modern Renaissance had been so amazing I felt that I wanted to step out of my comfort zone and give these shades a shot too. I would say that these shadows, particualry the mattes, are incredibly pigmented, there is no denying that whatsoever. The best advice when applying the matte shades I can give is to be gentle, the brush just needs a light tap to pick up more than enough colour. 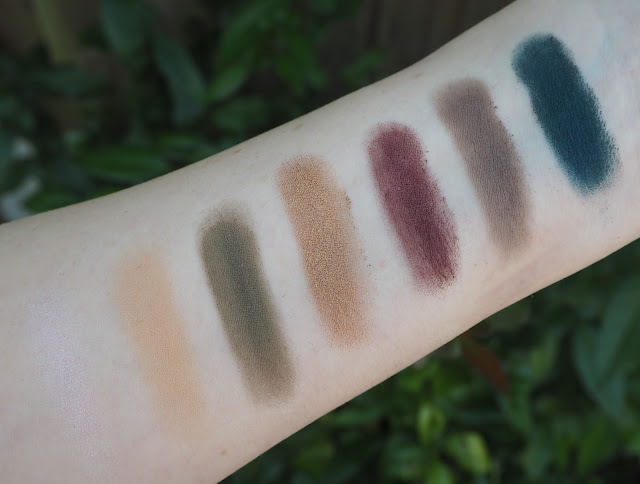 As a lot of people have experienced these shadows are pretty powdery and even just swatching them they feel incredibly soft to touch. They are definitely very lightly packed so some care is needed. Unfortunately I have had problems when applying these shadows, they take a lot of work to blend which is very frustrating and time consuming. Bizarrely some are better than others, for example the khaki shade Destiny I find extremely hard to blend whereas the teal shades Untamed and Axis worked much better. 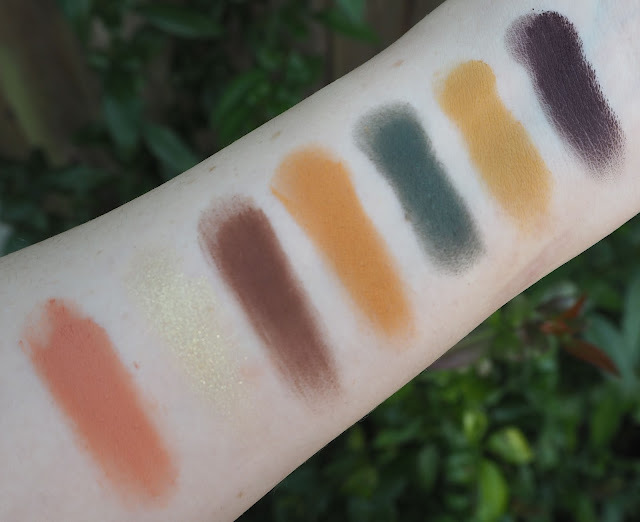 I found that All Star and Rowdy, the more purple toned shades, disappear as they blend and leave a very patchy look on the eye- not exactly what I was going for. As I mentioned there were two shades, Electric and Adorn, that are shimmery, pigments. I've used both a couple of times and absolutely love the green shade of Electric, its so pretty and I've not tried anything like it before. Adorn is a bronze shade, that again is pretty, but nothing out of the ordinary. The colour pay off for these I feel could be a bit better, I was expecting these to be 'bam!' but I haven't found that to be a case. There is also a duo chrome shade included called Cube, its a white shimmer shade that has an iridescent pink glow to it in certain lights. Its not massively striking applied to the skin but saying that I'm quite fair so that may be why. I did use it as a highlight on my cheekbone too and after building it up a little I liked the effect it gave. So would I recommend this palette? As much as it pains me to say it, no I wouldn't. Which is such a shame. The powderiness (not sure thats a word! ha) doesn't bother me as such but what bothers me is how they are so hit and miss when it comes to blending, I just find it to tricky to work with meaning I'm unlikely to reach for it on a day to day basis when I'm trying to rush out the door. I also feel like the colour range could do with a softer, neutral transition shade as the only one I would really use in this way is Dawn and I didn't like how it looked on me, it came out a little on the peach side. Watching reviews I also find it bizarre how some people seemed to get a good quality palette and others got bad ones which suggests to me that the way these are being made just isn't up to scratch. 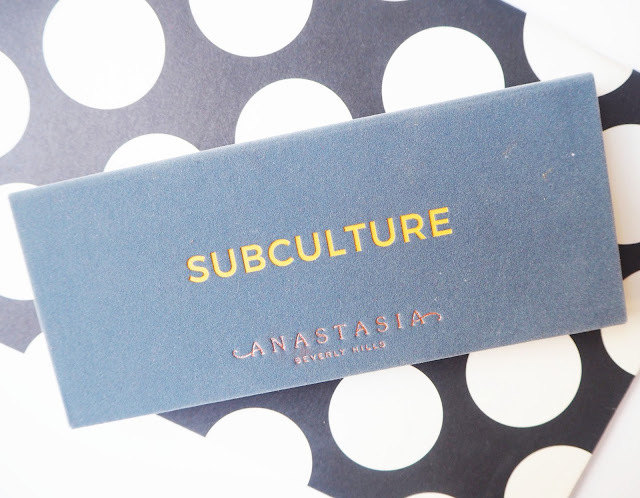 Have you tried out this palette? What did you think?